Autel Dual Frequency 315mhz and 433mhz TPMS tire pressure sensor programmable blanks. Must use updated Autel TPMS Tool to program. 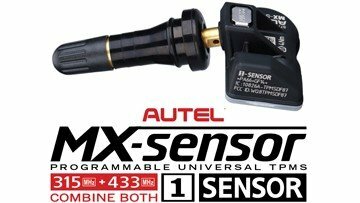 The unique Autel MX-Sensor patented press release valve design allows rubber and metal sensor valves to freely interchange by hand, without requiring a tool for sensor head fitting. Autel Sensors are built to match or exceed OEM sensors in frequency strength and durability. Autel guarantees sensors are free from manufacturing defects for a period of 24 months or 24,000 miles, whichever comes first. 100% ID clon-able/ No relearn required. Tested and certified to meet SAE standards.